The Kelly Letter bought shares of Google (GOOG) in the midst of the subprime financial crisis at an average cost basis of $407. They rose to a high this year of $630 on January 4, fell to a low of $434 on July 6, and closed Friday at $500. I listed GOOG as one of the letter’s best buys from May 23 until now, a period that included share prices between the $434 low and Thursday’s $509 high. Now that GOOG is back over $500, I’ve removed it from the short list of best buys. That’s due to valuation, however, not a lack of faith in Google’s future. I want to revisit the case for Google, having read and heard a great deal of skepticism about the company’s prospects as it competes with Apple (AAPL) and Microsoft (MSFT) in the hunt for online profits. Say you want to buy running shoes to train for a marathon. Five years ago you would have simply Googled it, looked at the list of results, weighed your options, and made the purchase, perhaps by clicking on one of the sponsored links that accompanied your search. Today you might still do that, but increasingly you might pose the question “What running shoes should I buy?” to your friends on Facebook, or maybe write “Who knows about training for marathons?” on Twitter. By the time shopping service Groupon sends you (and 25 of your friends) an offer for the perfect shoes and registration for a race, you’ll probably just pounce on it. Those two examples form the crux of the article’s argument that search isn’t what it used to be and, therefore, Google will need new business lines to grow. The growth of the internet itself is not enough to grow Google’s search business because search isn’t a core part of the new internet. I disagree. The examples offered are fundamentally flawed. In the first, we see a different way to gather information but not one that displaces initial search. While we may turn to our various online networks for personal advice on which shoes or other products to buy, where will the friends offering advice get their information? Somebody had to do initial research to whittle down the list of offerings in each category. They could always go to the source directly, such as a consumer website that specializes in product reviews, but a Google search remains the best way to get a list of such sources. Some people will have walked into physical stores to perform comparisons, but that option existed since long before Google took over the internet search industry. So, research still needs to happen even when many people get their information via word-of-mouth, or word-of-fingertip (typing) as the case may be these days. When you merely utter the word “research” anymore, it’s tantamount to planning to Google something, be it shoes, or restaurants, or the history of space exploration. Moreover, somebody fishing for tips from friends rather than Googling their own information is assuming that those friends have already done worthwhile research which, as I just pointed out, probably included Googling as part of an in-depth effort. In the second example involving the arrest of James Buck, we find a straw man. At no point in history was a Google keyword search the preferred way to get out of jail. Had Buck not found access to his Twitter account, he could just as easily have emailed a friend in California or called them. The State Department responds to phone calls as well and, by the way, automatically sends a consular to visit any American arrested abroad. They even provide a manual in English on how best to proceed in the arresting country’s legal system, and basic legal advice. I know this after an incident left me wiser and leaner at the end of an 11-day stay in a foreign hoosegow, and more familiar with a jail system than I thought I’d ever be. For anybody who has not been through such a firsthand experience abroad, details await at the end of a Google search on “assistance to US citizens arrested abroad” and a click to the travel.state.gov page that comes up as the first result. Maybe James Buck could have saved his network of friends the trouble of “rescuing” him by running that lowly keyword search from his cell phone. He may have quickly noticed that Article 36(b) of the Vienna Convention on Consular Relations “provides that the foreign authorities shall inform the consular officer of the arrest of a national ‘without delay’ if the national requests such notification.” Most local authorities will ask the arrested subject if he or she would like them to submit such notification, which is why doing nothing would likely have produced the same result as James Buck’s now famous one-word tweet. Thus, I reject entirely the argument that search is no longer a key part of the online experience. Social networking is great, but it did not supplant the need for somebody to research which running shoes are best for a marathon nor did it get James Buck out of an Egyptian prison. Google still plays a role in finding the right shoes, and the State Department needed neither Google nor Twitter to receive word that James Buck had been arrested and required a consular visit. If the argument that search no longer matters falls flat, then the case against Google becomes unconvincing. It owns search, as the Fortune article points out: “Google sites lead the US market with 64% of all searches conducted.” If that can grow or even stay constant, then the growth of the internet should produce more search activity that turns into more revenue for Google. As for it being a vulnerable one-trick pony, most great companies are exactly that. It’s di-worsification that usually causes problems. For instance, it doesn’t seem to bother anybody that Coca-Cola (KO) makes 100% of its profit selling drinks, that Exxon Mobil (XOM) makes 100% of its profit selling oil and gas, or that McDonald’s (MCD) makes 100% of its profit selling food. That’s what they do, and they do it better than most. Online search is what Google does, and it does it better than most. All of Google’s other efforts are aimed at growing its search business, and that’s fine. 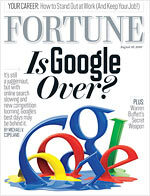 The Fortune article mentions Google’s budding sub-businesses such as Android, DoubleClick for multimedia ads, Google Apps for Enterprise, Google Me (a planned social service to compete with Facebook), and YouTube. To downplay the impact that these and other non-core initiatives will have on Google’s bottom line, the article quotes Caris & Co. internet and software analyst Sandeep Aggarwal as predicting that they’ll total just $5 to $8 billion in 2013, which is peanuts compared to the $40 billion that Aggarwal estimates search will produce in three years. While the Fortune writers see in that statement small numbers from the non-core businesses, I can’t help but notice the projected 74% growth in core search revenue on top of the new $5 to $8 billion from non-core business lines. Let’s take the middle of the non-core projected revenue range, $6.5 billion, and add it to the $40 billion in core search revenue to get total revenue in 2013 of $46.5 billion. Going from $23 billion now to $46.5 billion in three years doesn’t look like cause for concern, does it? I wish I could double my business revenue every three years. Other sources show Google’s current revenue being $26 billion rather than the $23 billion used in the Fortune article, but the growth rate to $46.5 billion remains impressive from anywhere below $30 billion. Finally, the article implies that Facebook advertising is going to prove more valuable to some advertisers than Google’s various forms of advertising. Real world results, however, give the nod to Google. As long as three years ago, advertising analysts found that Facebook’s way of advertising by targeting user interests was not as effective as Google’s way of targeting user behavior. The former relies on what people say while the latter relies on what people do. We should all know by now that actions speak louder than words. Comparing every single metric, Google AdWords visitors were far more engaged, far more valuable, and far better targeted. The traffic was cheaper and more consistent. The volume was far higher. It’s not even close. Facebook ads just don’t work. And for all the hype that it’s gotten, it’s not even in the same ballpark as Google’s AdWords. Not even the same league. While targeting users by their listed interests may sound promising, it’s just not very effective. More recent comparisons I’ve seen (by Googling the topic, incidentally) have shown Facebook narrowing the gap, but not closing it. It seems that knowing a person’s identity is less important than knowing what they’re looking for right now. For example, will my sister have better luck getting customers to Red Frog Coffee by targeting 30-year-old women within a 50-mile radius of the shop who identify “coffee shops” as an interest of theirs, or by targeting anybody searching on the phrase “coffee shop” within that same 50-mile radius? Probably the latter, because it allows flexibility for any demographic, for people who are traveling through the geographic zone instead of just those living there, and specifically people who are looking for coffee shops in the area. Advantage: Google. I’m sure results from both advertising platforms vary based on a number of factors, so there’s no doubt that an increasingly popular Facebook and its ever-improving advertising platform are a challenge for Google, but they’re almost assuredly not a game ending development for the search giant. Google has a history of surprising entrenched competitors with innovation. The search market itself was well established when Google came on the scene with its minimalist search box. I remember those days. I was one of the early users, and loved showing people stuck on Yahoo (YHOO) a new way to search. Since then, Google has managed to outflank installed software companies, such as Microsoft, with its excellent Google Docs system, and even browser makers with its unsurpassed Google Chrome browser that is both faster and more elegant than any other offering. To that, I’d like to add that Google is up to something more with its Chromium project than just pumping out the world’s best internet browser. I’ve contended for some time now that all of Google’s endeavors seem to be heading toward a grand unified offering that could finally present a real challenge to the operating system duopoly of Microsoft and Apple. Those parts are essentially in place now, and Google is in the final stages of pulling them together when it rolls out the Chromium OS this fall. There’s a nice three-minute video on the OS at YouTube that shows how most of what we do on a computer involves the internet anyway, so we should reorient the OS to emphasize the internet. Once that rolls out, it could be a compelling alternative to existing operating systems. Computer makers could bundle it for free, greatly helping their margins. Computer buyers would be able to get online within seconds of powering up their machines and access all of their online services, which comprise the bulk of what they’re doing with computers now anyway. What would they use? Anything they wanted, but probably a lot of what Google offers: Gmail, GDocs, Google Apps, Google Earth, YouTube, Google Buzz, Google Maps, Google Me social networking, and so on. What does Google hope to get out of this free giveaway? More people online to generate more ad revenue. All in all, I don’t see much of a problem in Google’s future. Even if it maintains its current hold on search, the mere growth of the internet will see its revenue advance smartly. If it does a few things right to grow search, its revenue will improve all the faster. If it proves clever with its many new lines of business, they should add a decent chunk to overall revenue as well. If all of this adds up to a doubling of sales in the coming three years, current shareholders will be happy. This entry was posted in Individual Stocks and tagged GOOG. Bookmark the permalink. Both comments and trackbacks are currently closed. I agree, Jason. With Google’s mobile OS “Android” selling 200,000 handsets a day, it’s becoming one of the top smart phone OSes available. With the ability to display ads in applications, searches, and maps, Google is poised to continue its dominance in the search market. Let us also remember that Google dedicates a significant amount of time and money to innovation, one of the few companies that is making changes to the way we work and play online. Thanks, Stu. That’s a good point about Android and the way Google is finding more and more places to put ads. We’re running a head-to-head test between Facebook and Google ad campaigns for Red Frog Coffee now, both restricted to within 50 miles of Longmont, CO. I’ll report our findings here when we have enough data to comment. I’ll start by saying that I’m not anti-Google, per se. I use it for probably 95% of my searching, but there are some things I still prefer from other service providers. As for your point, I don’t think it’s as much of a question as to whether or not Google is over, but instead more of a question of how much longer Google can continue exponential growth in an increasingly commoditized market sector. Google’s bread-and-butter is still search. As much as they’ve tried to make money in other areas (enterprise services, Gmail, YouTube, Android, social), search still accounts for 98%+ of all revenue. One could argue, as you’ve done, that Google is simply creating all of these side projects to increase their search traffic, but I’m not sure that is true. I think they’ve tried very hard to break the “one-trick pony” mold, but really haven’t succeeded (other than, perhaps, Android–however, margins here are razor thin). The search business has become a commodity in recent years and I don’t think it is logical to expect some radical shifts in new search technology coming anytime soon, if ever. We say Google makes it money from search, but in reality they make money from advertising. Stupid people click those stupid little links and Google makes billions. I question the sustainability of such a business model. Switching gears a bit, think if Google disappeared tomorrow. Sure, most of us would be devastated, but in reality it probably wouldn’t affect our ability to find information too much. There ARE other options–Bing, Yahoo (soon to be Bing), Ask, etc. While these may not be as fluid or accurate as Google’s algorithm, they still work pretty well and I’d bet that 98% of people would be able to find 98% of what they are looking for on any non-Google search engine. Google made a lot of its foundation and growth back when it was a 1000-5000 employee company. They’ve seen massive, massive growth in the last 3 years and I believe they’re pushing 30,000 employees worldwide now. That is my definition of “just another Microsoft in the making.” Perhaps they will surprise us with new toys in the coming years, but I don’t see it (most likely at the expense of our privacy, but that’s another story). As for some of Google’s other projects, you mentioned social networking growth. Keep in mind that Google has failed miserably in the social space, not once, not twice, not three times, but FOUR times now. It acquired Orkut and that has been a flop in the US (some markets in South America, I hear still use Orkut). Google Wave was promoted as a be-all, end-all social solution when it was in alpha/beta, but it flopped hard due to poor usability and lack of clear product direction. Google Talk really hasn’t done all that well now that Facebook has taken off. And finally, Google Buzz has pretty much been a disappointment. As for GoogleDocs, it’s okay, but the privacy issues are a deal-breaker for me (or ANY cloud-based office suite, for that matter). I have used Microsoft’s new Office Live for basic stuff and in my opinion it walks circles around GoogleDocs. So, will Google go away? Not a chance. Will it become the “next Microsoft” as it solidifies itself as a one-trick pony and continues to grow in a bureaucratic nightmare? Almost guaranteed. Great points, Geoffrey. Thank you for writing them here. I’ll concede that Google has gone quite corporate in the past ten years or so. I remember when its AdWords program sported a simple, fun interface for creating and managing ads. Now, it’s clear that people in need of justifying their jobs have gone crazy with it, and the interface is cluttered with too many controls and too much jargon. You know where you can currently find the simplicity and fun of the old Google AdWords interface? Facebook’s ad management system. That’s a problem for Google. On search becoming a commodity, however, be careful that you don’t write off the advantages of dominating a needed commodity. The beauty of controlling a commodity market is that it’s hard for newcomers to justify their arrival. “We do search, too,” isn’t very compelling anymore, hence Microsoft’s need to pop the champagne over Bing’s “growth” of 0.7% of the search market. I’m not downplaying it. They worked darned hard to claw that 0.7% from Google. That’s the point, though. Bing will never be much more important than that because Google dominates the commodity in a way that leaves few people interested in trying another way to do what they’re already doing just fine at Google. Also, I love Bing. I think it’s awesome. I can’t imagine a better effort at wresting share from Google. If Bing has enjoyed so little success, the odds of anybody else doing better are just about zero. Thus, let’s accept for a moment that Google will remain the preferred way of searching the internet. If so, that alone is a fine growth story. That’s what Fortune’s numbers inadvertently showed. They provided relatively low revenue numbers for Google’s new business, but they only looked low when compared to the big number projected for search ad revenue growth. The mere growth and proliferation of the internet to new devices will swell the coffers of the search leader. I, too, doubt that Google will make much of an inroad to the social networking industry, but I don’t think it matters. I remember when MySpace was supposed to be the Google killer, then Facebook killed MySpace, and now everybody is on Facebook, oops, I mean Twitter, er, I mean both until the next whatever comes along. Anecdotally, I’ve noticed quite a drop-off in Facebook activity recently, with many of my friends turned into lurkers who never post or comment or do much of anything. They created their accounts, stayed in touch for a while, posted photos, and now they’re sort of done. You know what they’re not done with, however? The internet itself. Which means…searching for stuff. So, I think occupying search is the online world’s equivalent of dominating the energy industry in the offline world. Offline, no matter what humans think up next they’re going to need energy. Online, no matter what comes next, people will need the ability to search. Commodities, both, and companies that dominate commodity markets do well over time. Online ads are most valuable on the devices that people use—and those devices are increasingly going to be mobile phones and other handheld devices. The success of those devices is tighly linked with the apps they offer. On those devices it’s not about offering the best browser or the best search results—it’s about needing the browser and search engines the least amount of time per day. The future of Google thus depends largely on the attractiveness of Internet users whose eyeballs they can get access to. The way it looks, it might well be that Android is going to be the most interesting market very soon. But that is not set in stone yet. Apple and Microsoft are both heavily vested in pushing to the top as well. So the difference is not that Google used to have 90% market share in PCs. It is that they used to have 90 % market share of what people did with their PCs when they used the Internet. They may still have 90% market share of search on mobile devices, but that’s not what people use their Android and iOS devices for. Right, and this is one way that Google’s heavy investment in Android and Chrome should pay off, and the reason Apple’s iAds are probably more of a threat to Google’s advertising empire than are Facebook’s ads.